We all know that cats should be brushed a couple is good for the health and appearance of cats, and the apartment becomes less hair. But how to comb a cat if it runs away or throws herself at you as soon as you see the brush?! To accustom the cat to the scratching, of course, as soon as possible. An adult cat to teach will have probably longer, but in any case it all depends on the nature of cats. It is important to focus on the procedure and be in a good mood - all the cats feel! First you need to choose an excellent location. Preferred the window sill - good lighting, the cat is limited in movement, and you are comfortable, no need to bend down. Also handy to brush on the table, in the light of a Desk lamp and the bathroom. Before brushing you need to teach the cat to this place to assist her and to stroke, to talk to her. Now let's talk about combs. A good slicker brush will reduce the time of combing several times, but not every owner is willing to buy it. The first time, it is sufficient to use the conventional massage brush or glove. Most importantly, the brush should not injure the skin of the animal! Massage comb with metal teeth have a special coating and it is important to change the comb coating is damaged. In advance put the comb in place, where they plan to groom the pet. The secret - the combination with feeding! The cat must be hungry enough and the food should be her favorite. It's best to use dry food or treats. If the cat is afraid, take it to the place of scratching, try rubbing a couple of minutes and put the bowl of food. Then start slowly to comb from head to end of back. If, after the first combing the cat runs away, lure her out of hiding with food and immediately begin to comb when she eats. Try not to give the cat to run away and constantly push food. If the cat bites and scratches, for the first time is better to wear unnecessary leather or cloth gloves to save skin. 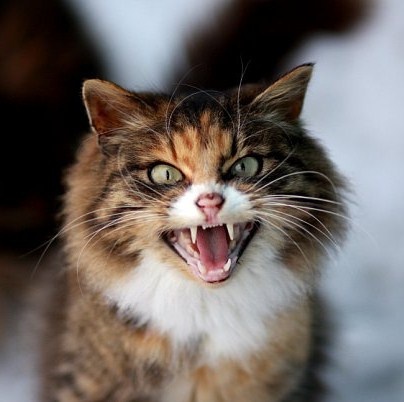 Aggressive cats can cope a little easier, the most important thing to distract them! You can also distract a feeding, or try a favorite toy. To do this, one person played with the cat, and the second standing behind began to scratch. Do not try to comb the entire cat for the 1st time. Combine the feeding and brushing 1 - 2 times a week, each time increasing the time of combing, and gradually the cat will become accustomed, will associate the hairbrush with food and no longer afraid and bite. After brushing, always give the treat and praise the cat. During combing wool can be electrified, and it gives the cat's discomfort. Be sure to Pat combed hair and remove the static from the comb. If the cat is not accustomed to brushing, try changing the comb. To comb the chest and abdomen, try to teach a cat to serve! Cat owners are often faced with the problem of shedding your pet, when the hair remains on the floor, furniture and clothes. To resolve this problem, it is recommended to comb the animal. In addition to the cleanliness of your home is also available for animal use. Combing is a wonderful massage for your pet, a way to improve the quality of wool and the ability to protect the cat from heat stroke in the hot season. However, sometimes Pets strongly resist this procedure. Why the cat resists the process of combing? If your cat resists the fact that you combed it, it means one of two things - or was held improper socialization, or he feels discomfort. Early socialization of a pet it is important that he is used to laying of hands. Then he will feel yourself comfortable and will allow you to comb his hair. So kittens often need to take hands from an early age, they should be brushed so that they get used to this procedure and to inspect the ears, eyes and teeth. If you give it enough time, you will reduce the stress, which matured cat may be experiencing in the future. To begin to teach your kitten to a regular grooming must have from 8-9 weeks. Yes, at this age, he still doesn't shed, he's got soft fur and the comb can not stay even one hair. However, it will last a phenomenon. And then you will have to deal with a naughty cat who is extremely negatively concerns to attempts on his coat. The first step is not to hurry, because combing should bring your pet only positive emotions. 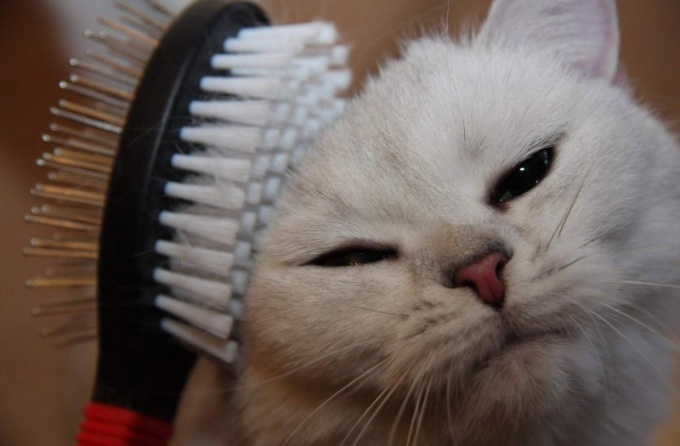 Start with short sessions of brushing, this will improve the level of tolerance a cat. To calm the animal before the procedure pet him or give him soft massages. In the process of combing gently talk to your pet - this will help to reduce his stress. Try to brush your cat on a schedule. Spend this procedure in a certain place and at the same time. For example, every day at 8 PM in the hall. If you can't follow the schedule, try to accustom the animal to a specific sequence of actions. For example: fed the cat, ate dinner by themselves, washed the dishes began to comb out, but not immediately after dinner, when cats get sleepy). Observe your pet, and you would decide the right time for this procedure. Learn how to brush a cat. If your dog's coat is matted, for a start it will be easier to use the services of cat Barber who will cut it neatly. It is better to start with better to use soft rubber brushes. Comb the cat needs from head to tail. Don't forget about the basic rules: do not scratch the tail or brush against the grain. Observe your pet to understand what scratching where he likes the most (neck, forehead, sides, cheeks...). If the cat begins to resist, try to avoid such places. Accustoming the animal to the procedure of combing, it is not necessary to force him to tolerate the unpleasant actions. Because then the cat will be afraid of one type of comb, to break, scratch and run away. Better to show the utmost patience and care in relation to your pet. And then with time, your cat will receive from the pleasure.